Tomatoes are the MOST popular of all vegetables! Once you know how to grow tomatoes, it's easy to get huge, tasty yields. Growing tomatoes is not confined to certain conditions either. Well it is, but luckily they are very tolerant little darlings and it's up to YOU to create the perfect home for them. This is possible whether you live in a hot or cold climate, live upstairs in an attic or at the top of the world in an igloo — okay, pelt me with rotten tomatoes, I'm wrong... it's NOT possible to grow tomatoes in an igloo. BUT you get the idea; with a bit of fiddle fuddling around, anyone, anywhere — mostly, can grow luscious tomatoes. Botanically tomatoes are fruits... but somehow tomatoes with chocolate ice-cream... no thanks. Originally called pomme d'amour or love apple by the French, we still adore tomatoes even though those aphrodisiac qualities from several hundred years ago have been disputed. So whether you say tomayto and I say tomarto or pomme d'amour; here's how to grow tomatoes. . . .
What are the best tomatoes to grow? To begin with, all tomato plants are classified as determinate or indeterminate. Determinate varieties are small bushy plants that don't need staking, grow to a certain size and produce one crop only. Determinate tomatoes are excellent to grow in containers or confined gardens. Indeterminate tomatoes grow on long vines and need staking. They keep producing tomatoes until cold or frost stops them. Most heirloom varieties—grown for their flavour, are indeterminate. With indeterminate tomatoes, any laterals (side shoots) that grow off the main stem and leader branches should be pinched out, as plants will not produce large abundant fruit if they are allowed to grow multiple shoots here there and everywhere. Carefully choose tomato varieties to suit your climate. Some famous cold climate tomatoes are 'Oregon Spring.' and 'Siberian Red.' And for warmer and more humid climates, it's best to check what others are growing locally. Also with humid areas, it's wise to choose varieties that have been proven to resist fungal diseases. About 6 weeks before you want to plant out your tomato seedlings, you can sow seeds. Best temperatures are between 24°C daytime to 16°C night for good germination. Transplant seedlings into garden or bigger pots once the first true leaves are formed above the small seed leaves. When planting in the garden, bury the stem, either upright or on its side, right up to the main leaves. Helpful roots will grow underground from the stem. Plant in a sunny, well drained, sheltered spot, in good compost which is slightly acid (pH5.5 to 6.8). It will take roughly 3 months until you can really start decent pickings. Seedlings should be 60cm apart, and if in rows, allow nearly 100cm between rows. This allows for good air flow and reduced moisture on leaves to combat fungal and blight problems and fruit decay. One good stake for the main stem and a stake for each of the 2 to 4 leaders is needed. A cage, netting or fence can be used to attach the stems, but the main thing to remember is to keep the branches off the ground to stop rot and to support the branches, as they can break easily. Use strips of cotton or stockings, or soft yarn and tie tightly around the wire or stake and looped loosely around stem just below a leaf node. 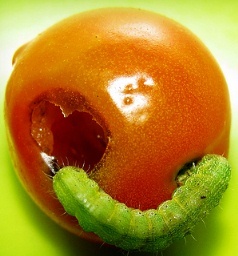 Pests and Diseases: Check each day if possible and remove caterpillars. Cover with netting if birds like your tomatoes. Remove leaves and spray with an organic fungal spray if any signs or blight, mildew or rot. Mulch: Mulching is important for tomatoes. It stops soil-borne diseases from splashing onto the leaves, it keeps warmth in but roots cool, retains moisture and control weeds. Feeding: A good rule is to feed your plant fortnightly when in full growth, then once fruit has started to form (this is called fruit setting), increase to weekly feeds. A liquid fertilizer both on leaves and roots is excellent. Water: Setting up an irrigation drip system is ideal before you plant, but otherwise water every few days or daily in hot weather. Watering is best done in the morning and around the roots. It should be even and regular otherwise blossom-end rot, sclerotorium and stem rots can occur. Sometimes even with the most careful of gardeners, a rainy downfall can happen and this can make the tomatoes swell and skins split. Pruning: Remove all leaves and shoots below the first main leader branches. You don't want soil or water splashing up. Also remove any particularly large or damaged leaves throughout the plants to allow light and air to get a look in. To establish robust plants with strong stems and roots and good leaf growth, it helps to remove the first flowers so the plants don't devote energy to forming fruit instead. Wait for plants to get to around 30cm tall before allowing fruits to set. NOTE: If you're like me, growing tomatoes brings out a gleam in a veggie gardener's eye. How long can we make the tomato season last, is a magic question? With a bit of TLC we can stretch it out. Although I've been growing tomatoes half my life and I thought I knew it all... I'm in love with this 'tomato bible' below. I can't praise it enough, and I believe it's by far the best way to learn how to grow tomatoes 100% successfully. There were 100 and one mistakes I made when I first started seriously to grow decent tomato crops. There is so much good and bad, in fact really bad advice out there, that it can be frustrating and wasteful to wade through it all. Here's what a reader, who now knows about tomato TLC, says. . .
"Just got myself a copy of this great book called How to Grow Juicy Tasty Tomatoes which is certainly a "must have" for anyone wanting to grow healthy tomato plants. What can I say? Let me go over it with you. It's written by a plant nutrition and disease specialist who's an expert advisor to professional growers and horticulturists, it's jam packed with all sorts of great info, including 260 colour photos. There's a wealth of information on soil preparation, growing in pots and greenhouses, staking, irrigation, nutrition, disease control and pest control. It also has a section on organic growing and growing by the moon phases. It comes with a CD which contains a huge database of 1300 varieties, plus 4 extra bonus files. I can highly recommend purchasing it — either as an ebook for instant download or in glossy hard cover format, delivered by airmail." Here's the link How to Grow Superb Tomatoes to bring out the gleam in your eye.